Please visit our new website. This site is no longer being updated. We are in the process of migrating fcta.org to the new site. In the above map, from howmoneywalks.com, Fairfax County is bright red because since 1993 taxpayers with Average Gross Income (AGI) totaling over $6 billion have left Fairfax County. Most have moved to neighboring Loudoun and Prince William counties, which are bright green. Counties in green have had a net gain of taxpayers. 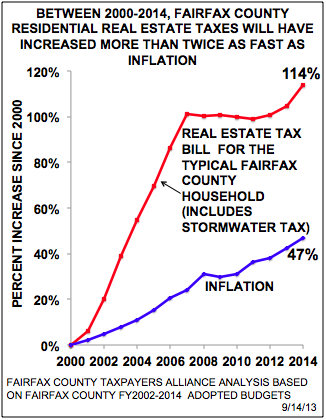 Meanwhile, between 2000 and 2011 the number of Fairfax County residents living in poverty increased 70 percent, from 43,396 to 73,794 (U.S. Census Bureau, 2000 Decennial Census and 2011 American Community Survey). 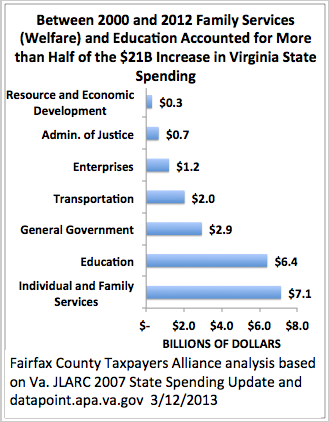 The Fairfax County Taxpayers Alliance finds that Virginia spending is out of control and that the major government programs, education and welfare, are broken. Between Fiscal Year (FY) 2012 and the start of the housing bubble in FY2000, Virginia expenditures increased 94 percent, from $22 billion to $43 billion, an increase of $21 billion. Over the same period inflation was 34 percent and Virginia population increased 15 percent. Of the $21 billion in increased expenditures, $6.4 billion went to education spending, which increased six times faster than population (91 percent vs. 15 percent) and $7.1 billion went to Individual and Family Services, about half of which is Medicaid, which increased seven times faster than population (112 percent vs. 15 percent). Virginia education and welfare programs,consume more than half of state expenditures and have the fastest growing budgets. According to the 2013 ACT college admission test results, of the 22,165 Virginia seniors tested, only 37 percent were prepared for college. Only eight percent of African/American seniors were prepared for college. A four-year college degree no longer guarantees a job. Despite increasing welfare spending seven times faster than population, Medicaid nursing home care is problematic, there is still a long waiting list for Medicaid waivers for the disabled, and subsidized housing, food, medical care, and childcare for unwed mothers creates an incentive for out-of-wedlock births. Since 1960, the percent of Virginia children born out-of-wedlock has increased from 3 percent to 28 percent (in 2011). Fixing these programs requires change. Instead of fulfilling its constitutional mandate to provide a quality education, the Department of Education facilitates statewide mediocrity and should be abolished. Schools should be accountable to parents, not to the state. Likewise, in large school districts, schools should be effectively made charter schools with policies determined by each school’s staff and emancipated from district administrators. Public schools need competition, with each other and with private and home schooling through tuition tax credits. Medicaid should cease to be a right. Families, including extended families, should have the primary responsibility to care for their elderly and disabled, with the help of private charity including churches. With an increasing number of elderly and proportionately fewer workers paying payroll taxes, government can no longer guarantee, and in fact is now not providing, quality care. Government’s attempt to replace families and charity is failing. Those already on Medicaid can be grandfathered and the neediest could be added, but the public needs to understand that the federal government with its $12 trillion public debt and half-trillion dollar annual deficits cannot be relied on for expanded Medicaid funding. 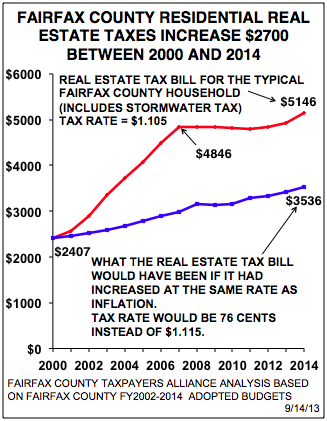 The Fairfax County Board of Supervisors increased real estate taxes 100% (from $2400 to $4800) between 2000 and 2007. Last year the supervisors increased real estate taxes by 1.9 percent ($93 for the typical homeowner). This year the supervisors increased taxes another 4.4 percent ($219). Compared to 2000, this is a cumulative increase of 114 percent and gives the supervisors an extra $1,190 million (nearly $1.2 billion) in revenues. Most of the extra $1.2 billion is not spent to improve county services but to subsidize the soaring cost of school and county pensions, zero-deductible medical insurance, and raises. Each year, hundreds of advocates for higher taxes testify at the Board of Supervisors budget hearings, generally held in late March or early April. Speakers for higher taxes greatly outnumber advocates for lower taxes. The Taxpayer Alliance every year sponsors a rally on the first night of the budget hearings, at 6. p.m. in front of the Government Center. Attend next year's rally, which will be announced on this site. Also, write (do not call or email) your supervisor to ask for lower taxes. Go to "Identify your elected representatives" section above to identify your supervisor. The Great Recession .... or the Great Bubble? The term "Great Recession" suggests that there is less wealth now than before the housing bubble (2000-2007) began. 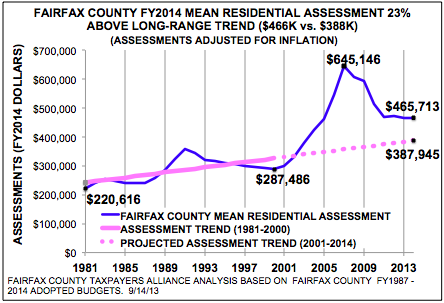 However, the FY2014 Fairfax County median residential assessment is $465,713, which is 62 percent higher than the inflation-adjusted mean residential assessment in 2000 ($287,486) and 20 percent higher than what the mean inflation-adjusted assessment would have been today ($387,945) if assessments had increased at the same rate as they did in the two decades before 2000. The following three handouts are explained in the video, below. 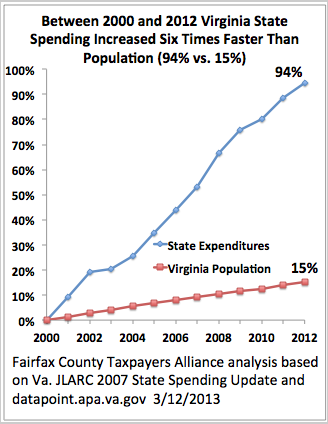 The Virginia and Fairfax County spending trends described in this video (courtesy of freedomleadershipconference.org) are probably typical of spending trends in states and counties nationwide. Fred Costello Report 093: Is an Increase in the Real Estate Tax Rate Affordable? FCTA 2013 Winter Bulletin - Sharon Bulova misleads taxpayers? Note: The magisterial district link is slow and the form is hard to understand. Your street number, street name, street type (Road, Lane, Court, etc.) all go in separate boxes. Once you identify your magisterial district go to the Board of Supervisors and School Board pages to identify your supervisor and school board representative. Fairfax County transportation projects totaling $8.1 billion over ten years. This file was provided by the Fairfax County Director of Public Affairs. 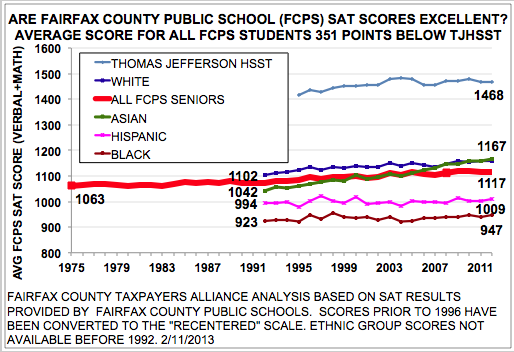 It is not posted on the Fairfax County website. Excel spreadsheet prepared by the FCTA based on the above file. The county refused to provide the above file in spreadsheet format. County Chairman Sharon Bulova wants to increase taxes $300 million per year to finance these projects. This was not mentioned during the last Board of Supervisors election. 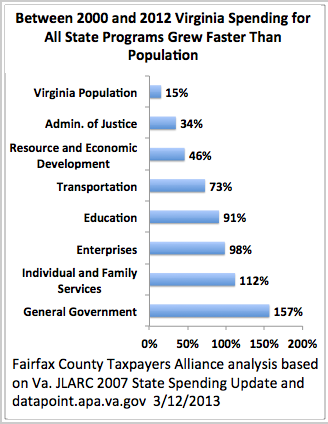 Virginia has plenty of money for transportation, without additional tax hikes. Between FY2000 and FY2012, the Virginia budget (General Fund + Non-General Fund) increased by $21 billion, from $22 billion to $42.7 billion, a 94 percent increase. Over the same period Virginia population increased by only 15 percent, from 7.1 million to 8.2 million. $6.4 billion went to education, which increased 84 percent, from $7.1 billion to $13.5 billion. $7.1 billion went to Individual and Family Services (includes Medicaid), which increased 112 percent, from $6.4 billion to $13.5 billion. These three items account for $15 billion of the $21 billion increase. The numbers above come from the Joint Legislative Audit and Review Commission (JLARC) Review of State Spending: 2007 Update, Review of State Spending: 2012 Update (see especially page 39 of the latter), and the Commonwealth Datapoint website. (There is a small inconsistency between JLARC and Commonwealth Datapoint numbers.) Spending is not adjusted for inflation, which is appropriate because private-sector wages are not keeping up with inflation. How carefully have the General Assembly and the Governor managed these disproportionate increases in education and Medicaid spending? According to the ACT college admissions test 2012 Profile Report for Virginia, of the 21,647 Virginia students tested, only 33 percent were prepared for college (p. 7). Of that sample, while 40 percent of white students were prepared for college, only 7 percent of African-American students were prepared, showing the state's neglect of minority student achievement (p. 22). Despite being the largest and fastest-growing item in the Virginia budget, Medicaid is broken. The waiting list for Medicaid waivers, so disadvantaged persons can be cared for at home instead of institutions, has over 7000 names. For those lucky enough to get a waiver, the reimbursement rates are too low to retain caregivers. Reimbursement rates for doctors are low, making it difficult to find doctors accepting Medicaid. Fraud is a problem. Medicaid promotes dependency instead of self-sufficiency, and where charity is needed private charity is more efficient than charities run by politicians. New taxes reward and subsidize the General Assembly's and Governor's failure to rein in out-of-control spending on education and Medicaid, programs that are not meeting their goals. Rather than raise taxes, elected officials should better manage the revenue they have. Obama's Path to Bankruptcy: This is the Obama administration's projection of the federal debt. It assumes "tax hikes for the rich," predicted savings from "Obamacare," and the end of the war in Afghanistan. Yet, the Treasury Department's Citizen's Guide to the 2011 Financial Report of the U.S. Government states (p. xii) states, "The continuous rise of the debt-to-GDP ratio illustrates that current policy is unsustainable" (emphasis added). Evolution of the Nanny State: In 1960 defense was 55 percent of federal outlays and entitlements were 26 percent . 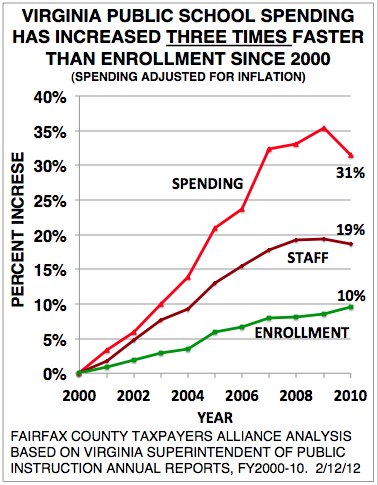 By 2011 defense was 20 percent of outlays and entitlements, including education, were 64 percent. The President's FY2013 budget projected $3.8 trillion in outlays and $2.9 trillion in revenues, leaving nearly a $1 trillion deficit. To eliminate the deficit without eliminating defense requires significant cuts to entitlements. As a condition to raising the debt limit last year, Tea Party congressmen required cutting the annual federal budget (about $4 trillion) by $100 billion. This is only a three percent cut. However, the resulting agreement, called the Budget Control Act of 2011, or "sequestration", imposes a disproportionate share of cuts on defense while sparing entitlements. New Here? What can I do or how do I get involved? FCTA members are concerned citizens like yourself. Join us for a meeting, volunteer to keep our our local and state government accountable, help analyze government spending, and speak out about government waste!